Congrats guys...truly a great work! Sorry for bumping this thread but I just found this story on Youtube and think it's great. I love how it actually manages to look into Sally's actual Satam character and look into her flaws rather poignantly (while still making lots of jokes at the expense of her pride). This is basically an exaggeration of how I idealistically see Sally; a well meaning leader, but one that is so obsessively meticulous and cautious in her attempts to protect and lead her team she sorta forgets the ends while doubling her means and becomes an overbearing control freak. Why so few official writers can get this characterisation is beyond me. Of few complaints I can give are that maybe Rotor and Antoine would have worked better with the roles switched (Antoine as wimpy Cratchet, Bunnie's spouse, corrected about addressing Sally and Rotor as the kind easy going Fezziwig). Also I think the gag with the Christmas Yet To Come kinda spoiled the poignancy. It could have still been tongue in cheek, but something more meaningful than a meme reference could have done so much more. And Ann Chovi, your expressions for Sally are unmatched. Sorta like the Archie Sonic comics. Just read it. A really nice Christmas Carol interpretation with SatAM characters. The drawing style is magnificent!! Absolutely love the expressions and poses. Bonus points for the ending! Heh, I'd almost forgotten about that. 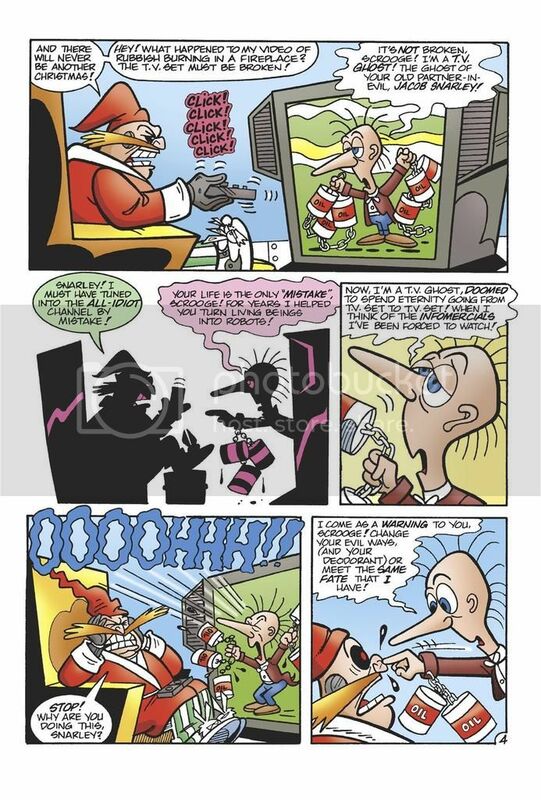 Funny though that Snively ended up playing the same role in both the fan comics version and Archie's. That's not a coincidence; I actually grew up very fond of the Archie Sonic Christmas Carol, and felt that several of its "casting calls"-Rotor as Bob Cratchitt, Snively as Marley, Sonic as the Spirits, etc.-were simply too good to pass up.